All Ramsey County cross-country ski trails were packed Jan. 8. Due to low snowfall totals, traditional tracks could not be placed on most trails. Classic tracks are available at Tamarack Nature Center trails as well as Battle Creek East. Trail locations, maps and rules. Battle Creek Regional Park East: Trails groomed Jan. with classic tracks. Trails rated in fair condition. Vadnais-Sucker Lakes: Trails packed Jan 8. Please note: Saint Paul Regional Water Services is removing buckthorn and dead and diseased trees from the east side of Sucker Lake throughout the 2015-16 winter. Trail access and conditions on the east side will be regularly impacted. Grass Lake: Trails packed Jan 8. For firsthand trail reports, visit skinnyski.com. A Minnesota State Ski Pass is required to ski on all trails for skiers age 16 and above. The Winter Recreation Rental Shack at Tamarack Nature Center is open for rentals. Hours are Monday – Saturday from 10 a.m. – 4 p.m. and Sunday from 12:30 – 4 p.m. Equipment rentals are for a minimum of two hours, and all rental equipment is due back by 4 p.m. 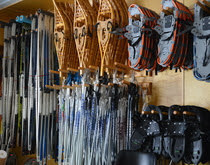 Skis and snowshoes are available in both youth and adult sizes.